Freight is shipped directly to the end user without passing through warehouses or distribution centers in the importing country. Lead time and total cost are reduced, while also realizing traceability through all stages of shipping. ● I'm worried that large number of shipping processes increase total transport lead time to lose sales opportunities! ● I'm concerned that large number of shipping processes is labor-intensive and high-cost, decreasing my company's price competitiveness! ● Traceability information is so fragmented that I can't confirm the location of the ordered product. I'm unable to stop complaints about delayed delivery. After import customs clearance in Japan, the freight is delivered directly to its destination without passing through a domestic warehouse. This shortens the lead time required for domestic transfer. Affixing of delivery labels and sorting according to destinations, normally performed at domestic warehouses is executed in the exporting country. This reduces domestic warehouse expenses, to cut down double handling costs. 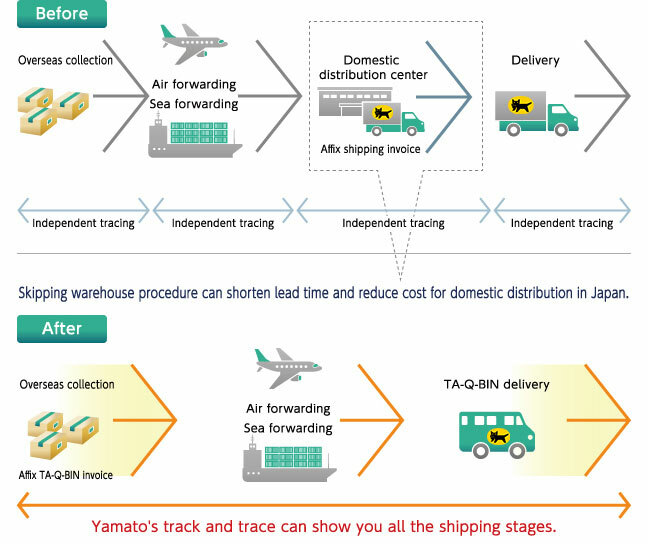 By using a delivery label issuance system and freight traceability system, Yamato realizes visualization of freight in every stage from the exporting country until the destination. → It is possible to keep delivery information hidden in the exporting country. → In case of sea freight with long navigation days, it is possible to decide the destination after exporting. → It is possible to conduct high-quality inspection in the exporting country. -Yamato Group also handles collection/repair of home appliances.